Locust Projects is proud to present In Process [Civic Sculpture], a new site-specific installation by Miami-based artist Michael Loveland. Primarily known for working in sculpture and painting, this new site-specific installation is informed by the artist’s experience in citizen activism, specifically, bringing historic designation to the Palm Grove neighborhood in 2009, creating the largest historic district in Miami-Dade County. He also worked with the community and civic government to secure funding to return indigenous plants to the neighborhood. The artist designed the installation to serve as a dynamic gathering space using his signature kinetic style mixing found objects and imagery as a backdrop for holding important public conversations about historic preservation, placemaking and environmental justice. While primarily known as a visual artist, Loveland has quietly been working on urbanism-related activism in the Palm Grove neighborhood, where he has lived since 2002. A key example of Miami’s development between the 1920s through the late 1950s, the predominantly residential area was endangered of rampant development. To help preserve the character of the neighborhood, Loveland worked diligently to spearhead the historic designation of the area, which passed in 2009. In addition, he has helped the effort to reintroduce indigenous plants after observing companies profiting off the sale and planting of exotic plants over natives. The installation at Locust Projects visualizes Loveland’s activist efforts, which has not been a focused subject of his prior work. The walls of the space are encompassed by a mural of Palm Grove's forty-eight city blocks and presents an abstracted version of city planning maps of the neighborhood. The white areas represent city blocks and speckled dots represent where new plants are being reintroduced into the neighborhood directly because of the artist’s efforts. The colored stripes that make up the base layer of the mural are inspired by the colors of buildings that populate the historic district. The wall sculpture configurations recall Robert Rauschenberg’s combines, a noted major influence on the artist. 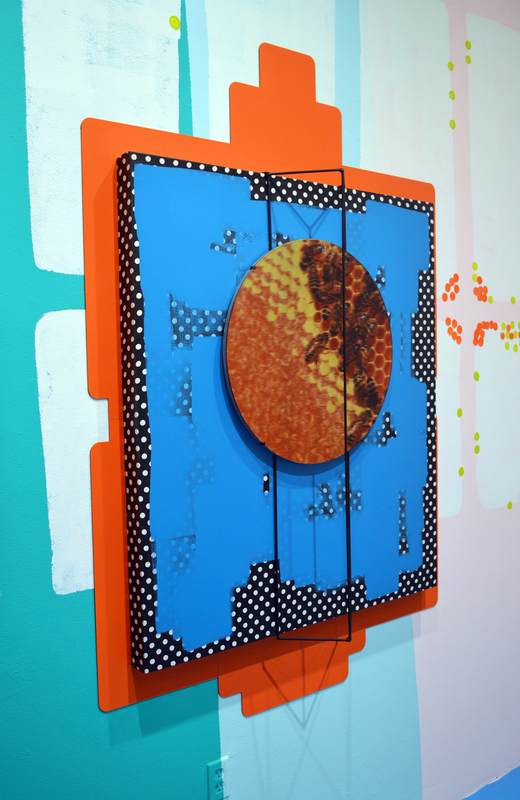 These works incorporate canvases wrapped in polka-dot fabric found in Haitian-owned fabric stores, lattice geometric forms jutting from the work and metal frames that allude to the architecture of the neighborhood that inspires the installation. While Loveland has long worked with found images, he has recently been introducing his own photographs into his sculptural works over the past few years. Here, he introduces images he took from around the Palm Grove neighborhood and printed them onto found glass. 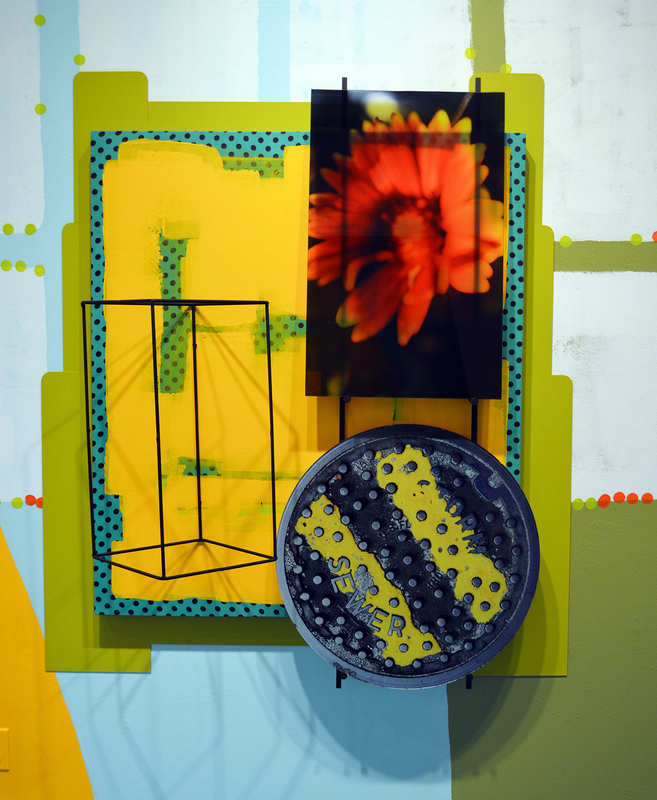 The images depict both urban and ecological elements from the area such as images of flowers and beehives, contrasted with manhole covers and broken metal fences. Together they depict the visual eclecticness of the neighborhood. 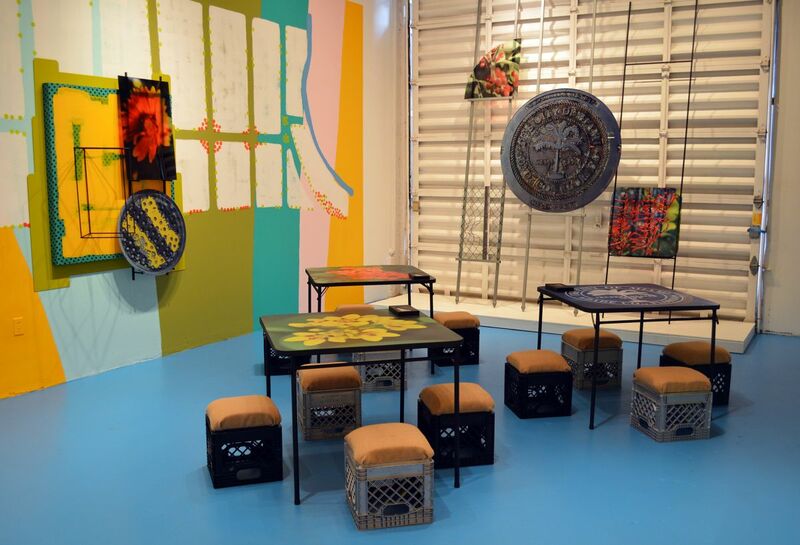 During regular gallery hours, the installation will be populated with folding tables and milkcrate seating where visitors can linger to play dominos. These functional sculptures help activate the installation as a site for programming related to urban ecology, climate change and historic preservation, furthering a dialogue with the community on how individual action can impact larger goals to make our city a more vibrant and sustainable place to live.